I just read an online article the other day that claims that the earth’s surface has become brighter since 1990, but no one is sure why, not even the geeky scientists. For us non-scientific plebeians, this has certainly spelt an escalation in global warming. And so, though we should be rejoicing over the prospect that our world has become brighter, many would prefer the dimmer, darker and cooler days. Our fear of discomfort seems to outweigh our fear of the dark. Although scientists continue to debate over the cause of the brightening skies, we Christians, have our definitive answer. That very first Christmas, the whole world, in fact the whole universe, became brighter and the dark has never been able to diminish its brilliant light. The metaphor of light makes sense only against a background of darkness. The darkness of which Isaiah speaks is an entirely different kind of blackness than the restfulness of night or a physical inability to see. Isaiah’s darkness calls to mind the darkness that can envelop one in the depths of depression — “the land of deep shadow,” or in another translation, “the land of gloom.” It is a darkness that has swallowed hope, a darkness where one has forgotten the sun’s promise to rise. It is the darkness of a people who live in exile, a people who have lost everything, and a people who are uncertain of God’s assistance or even His existence. There are moments in our lives when we too are enshrouded by this kind of darkness. If one has been residing in such darkness for a long time, one would expect the people to be excited with the first rays of dawn breaking through the long night of despair. Unfortunately, many forces lead people in directions today, away from the light. People prefer darkness. The thing about the light of revelation is that it illuminates every cobwebbed corner, every nook and every cranny. It’s a two-edged sword: the first edge is that it reveals our true identity as God’s children, and the second is that it exposes the lie that we are living with the splendour of Truth. That second kind of light can be difficult to walk in. It’s a shock to the system to have it hammered home to us exactly how dim the road we had been walking. Just like light banishes darkness, God exposes that which is not in Him. He expels any lingering shadows that try to cling to us, along with the negativity and pessimism that those shadows bring. What Isaiah spoke of in prophecy, we today celebrate as fulfilled. On that first Christmas Day, the angels announced this news of great joy to the shepherds: “Today in the town of David a Saviour has been born to you; he is Christ the Lord.” The dreary darkness that surrounded the shepherds, the first witnesses of this great news, as they tended their flocks instantly changed. 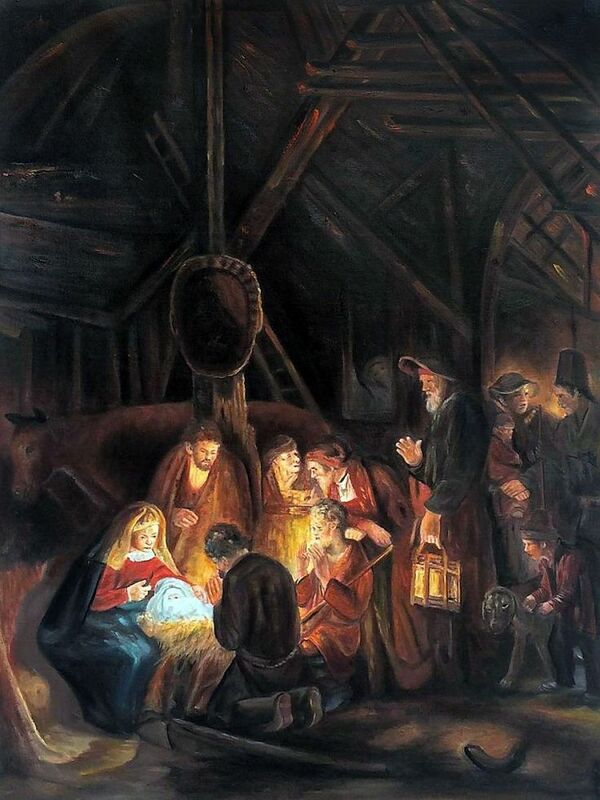 The great Dutch artist Rembrandt’s painting The Adoration of the Shepherds portrays the darkened stable in Bethlehem where two shepherds kneel beside the manger while other people stand farther away. One man holds a lantern, but the brightest light shines not from his lantern but from the Christ-child, illuminating those who have gathered close to Him. This is the bright hope of Christmas! “The people that walked in darkness has seen a great light; on those who live in a land of deep shadow a light has shone.” The King of the universe entered into our darkened sin-ridden hopeless world as a fragile human baby. He grew to be a man who was ignored, despised, rejected, and killed by those who preferred the darkness to the light. “He came to his own domain and his own people did not accept him.” But to those who did welcome Him, who accepted His light, “He gave power to become children of God.” This ultimately is the fundamental divine-human exchange. The essence of sin is man substituting himself for God, while the essence of salvation is God substituting himself for man. He took our darkness and gave us Light, Life and Salvation. We are indeed people who walk in darkness. Lonely, lost, fearful and seemingly hopeless. We are those people. And we do not deserve the light that breaks on us. Nevertheless it does. It does, it has, and it will. It breaks on us as it did on Isaiah’s people because its source is the God “in whom there is no darkness at all” (I John 1:5). Christmas invites us to step out of the shadows of darkness and to allow the light of Christ to shine into our hearts. Rejoice with the angels! Rejoice with the Blessed Virgin Mary and St Joseph! Rejoice with the shepherds! Today a saviour has been born to us; He is Christ the Lord. The world is indeed looking a great deal brighter!